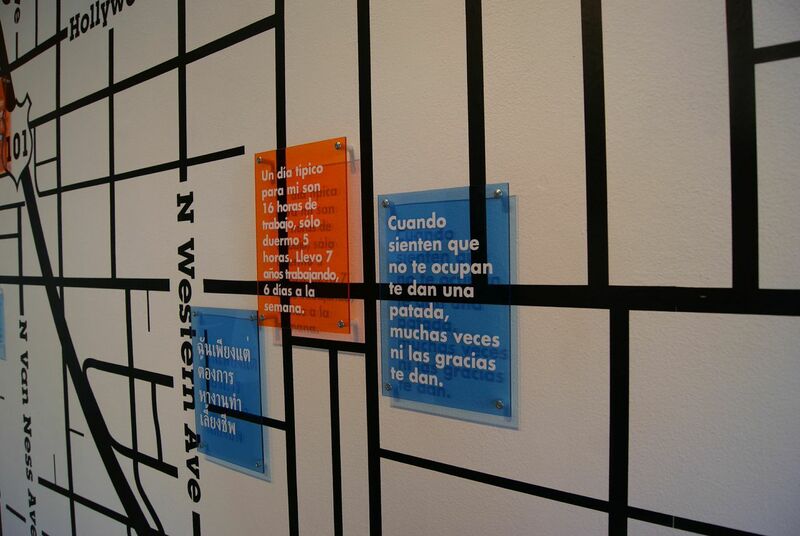 In the summer of 2014, LACE presented Help Wanted, a research-based residency and exhibition by the Cocina Abierta Collective. Since 2011, the collective has documented and born witness to the experiences of restaurant workers in Los Angeles. The collective’s public practice provides a platform for engaging restaurant workers and consumers in dialogue about the realities of the restaurant industry. Through these pedagogically driven engagements, the collective facilitates the fluid exchange of immigrant histories, culinary skills, and base building strategies towards the development of a worker-centered philosophy to eating ethically. 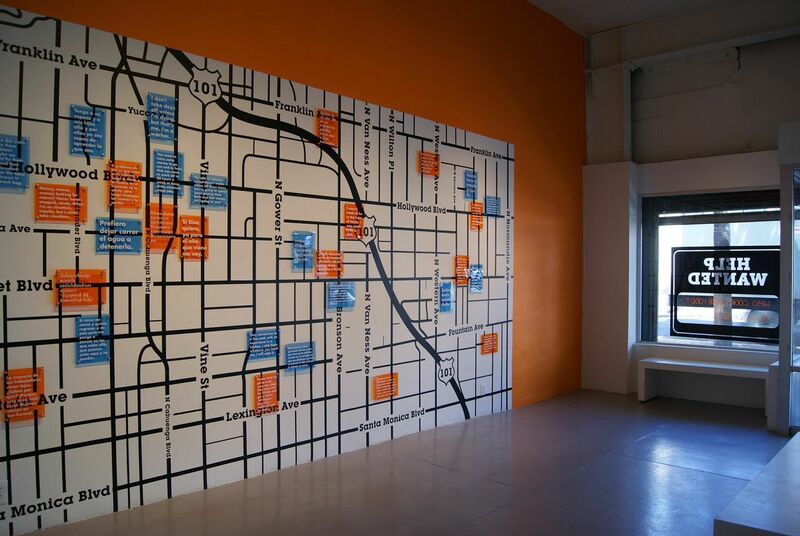 For Help Wanted, curated by Jacqueline Bell, the collective chose to investigate the neighborhood of Hollywood from the perspective of the restaurant worker. Los Angeles leads the United States in wage theft, with approximately twenty-six million dollars stolen from low-wage workers by employers every week. Other labor abuses are also rampant, with many workers refused breaks, overtime pay, or paid sick days. The Cocina Abierta Collective’s members have a personal and professional stake in the industry that motivates their participation in the food justice movement. Comprised of artists, long-time restaurant workers, activists, and members of the restaurant worker advocacy organization, the Restaurant Opportunities Centre of Los Angeles (ROC-LA), the collective members are deeply invested in how ‘food justice’ can be understood as more than a conversation about the quality of food (non GMO, sustainable, organic, etc. ), to also include the ethical treatment of the people who handle and cook the food that we eat. This video series documents the research-based residency and exhibition, Help Wanted, as well as providing critical insight into the collective’s methodology and the larger political conditions that inform their practice. The first video introduces the collective members and their relationship to the restaurant industry. The second video documents the collective’s work at LACE, and the street-based research and organizing work that was undertaken in Hollywood. The third video documents the public interventions that took place as a part of Help Wanted; including an intervention at theHollywood Farmer’s Market, where consumers were engaged in dialogue around the question, “what is ethical dining?”; and an intergenerational dialogue with former restaurant workers from Hollywood’s Thai Town that was facilitated through a partnership with Thai CDC (Thai Community Development Center). ABOUT THE RESTAURANT OPPORTUNITY CENTER OF LOS ANGELES (ROC-LA): The Restaurant Opportunities Center of Los Angeles (ROC-LA) is a restaurant workers center that strives to improve working conditions for restaurant workers in LA county. The Los Angeles metro region has the largest restaurant industry in the nation making it an ideal place to apply our ROC model which involves ‘surrounding the industry’ – a tri-pronged approach to building power for restaurant workers. ROC simultaneously 1) conducts comprehensive research and policy work to raise consciousness and lift standards for workers in the industry; 2) organizes workers to demonstrate public consequences for employers who take the ‘low-road’ to profitability, by violating workers’ legal rights; and 3) promotes ‘high-road’ restaurant owners that pay and treat their workers well. ABOUT THE COLLECTIVE: The Cocina Abierta Collective is a nomadic experimental “test kitchen” run by a group of Los Angeles-based artists and restaurant workers. The collective operates in the public sphere, collaborating with home cooks to become food innovators and community storytellers. Organizing food based communal gatherings, as well as dialogues around the topics of cooking, food history, and restaurant labor, Cocina Abierta seeks to harness the power of restaurant workers, home cooks, and consumers to contribute to building a just food system that puts the health and well being of our communities first. In 2014, collective member Christina Sanchez Juarez was awarded the inaugural SPArt Los Angeles prize, an award for artists who intend to create social change through art. The collective is currently working on a community based project at Victoria Community Regional Park commissioned by the Los Angeles County Art Commission. ABOUT THE CURATOR: Jacqueline Bell is an independent writer and curator currently based in Banff, Alberta, where she is completing the Curatorial Research Practicum at Walter Phillips Gallery, The Banff Centre. In addition to producing Help Wanted with the Cocina Abierta Collective, she has recently curated exhibitions and projects with artists Gala Porras-Kim, Divya Mehra, and the collectives Ghana ThinkTank and Talk is Cheap: Unincorporated Language Laboratories. Bell is a part of the team producing (SPAN) Social Practices Art Network, a media resource for a variety of socially engaged art and design practices. Her writing has appeared in C Magazine and X-TRA: Contemporary Art Quarterly, with forthcoming texts in PUBLIC and The Journal of Curriculum and Pedagogy. She is a graduate of the M.A. Art and Curatorial Practices in the Public Sphere program at the University of Southern California. Learn more about Cocina Abierta Collective: Help Wanted at LACE here. Practice Sessions: Help Wanted is made possible by the Institute of Museum and Library Services. Additional support for Help Wanted has been generously provided by the City of Los Angeles Department of Cultural Affairs. SPArt, a funding initiative that supports Los Angeles-based Social Practice Art projects, has funded the ongoing work of the Cocina Abierta Collective.